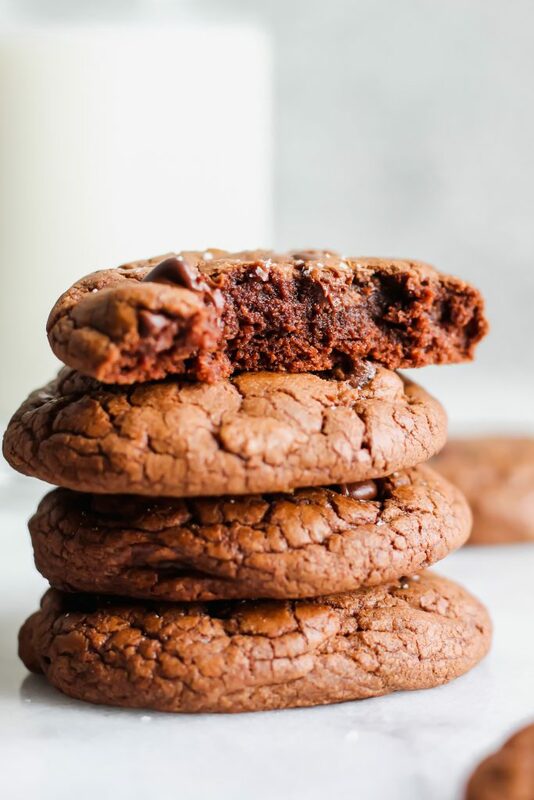 These Fudgy Brownie Cookies are the absolute perfect blend between a cookie and a brownie. Slightly crispy edges, fudgy brownie center, and a deep chocolate flavor! Perfect for the chocolate lover in your life!! I feel like I have a track record of posting cookie recipes on my birthday here on OBB. 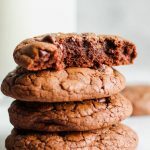 Last year, I wrote all cookies and how I balance treats in this post. Maybe I should make it a tradition. 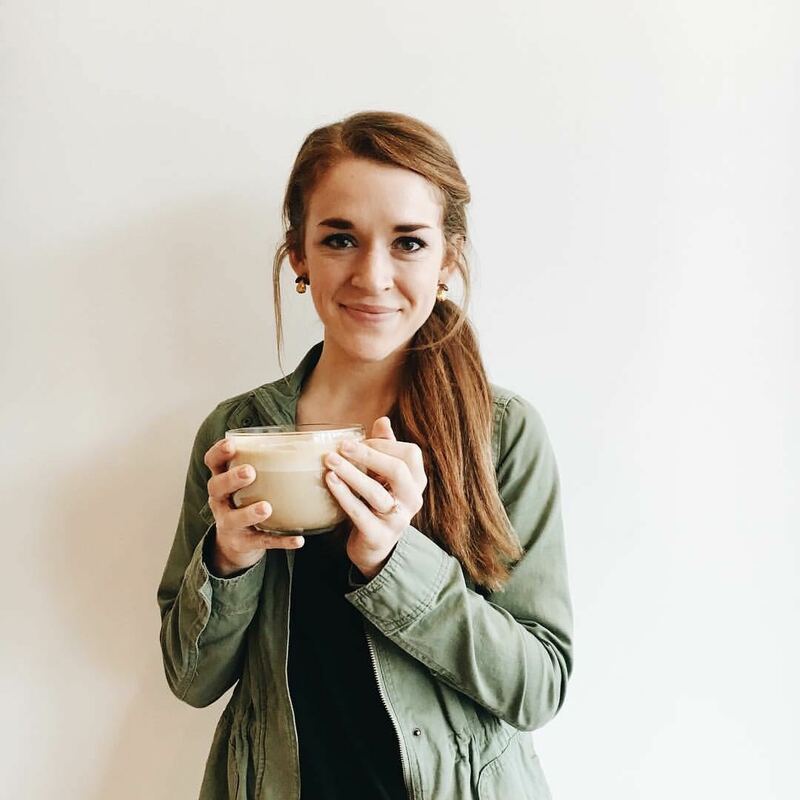 Side note: I really miss writing more personal posts like I did in the #loveyourbalance series. I kind of let it go when we bought a house. Do you guys miss those posts?! Or would you rather just me write the recipes and be done? Let me know in the comments! ANYWAY…so yes, today is my birthday! And what would a birthday be without something delicious and sweet?! Since I just haven’t been able to master cake baking yet…here we are! 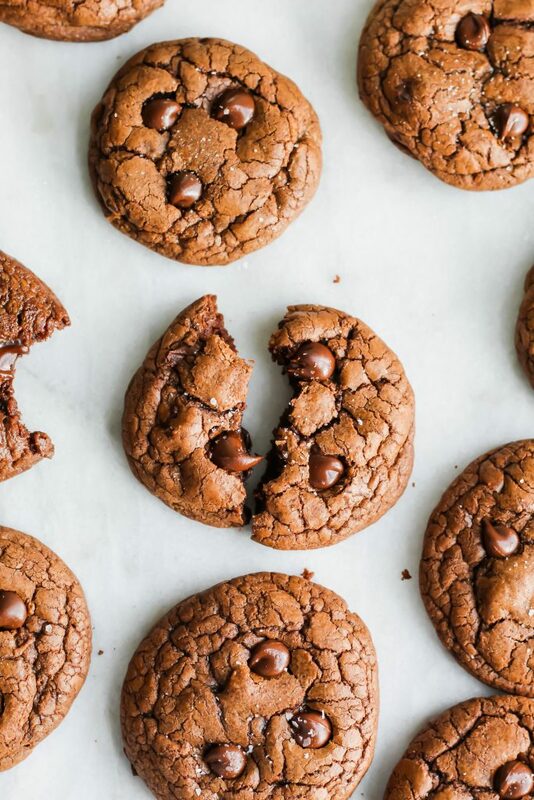 Fudgy Brownie Cookies! AKA the best thing since sliced bread. 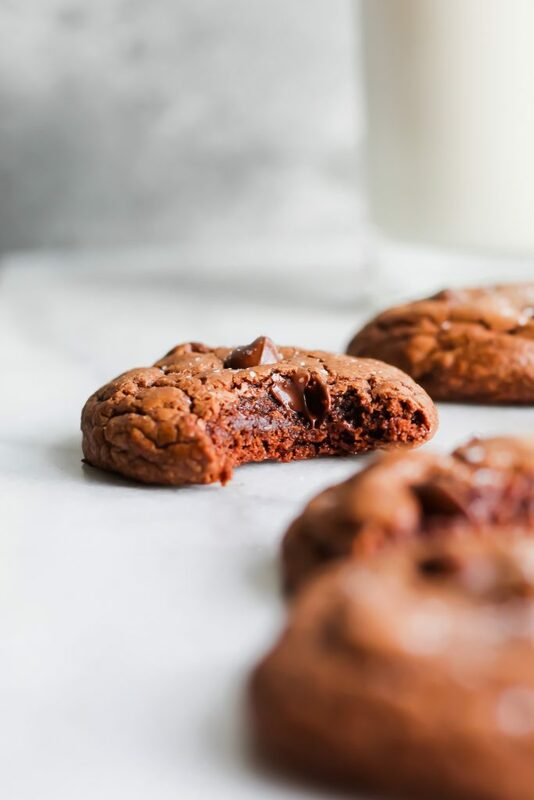 Seriously, these Fudgy Brownie Cookies combine two of my all time favorite things: soft chocolate chip cookies and fudgy chocolate brownies. The edges get crinkled (just like the tops of brownies! ), the edges are firm and slightly crispy (like cookies!) and the middles….are gooey, fudgy and over the top amazing. Sprinkle some flaky salt on top, pour a cold glass of milk and you’re literally set for the best cookie EVER. This is definitely one of the easiest cookies to bake. First, you’re going to melt the semi-sweet chocolate. I used a combination of chocolate chips and a chocolate bar I needed to use up. I found it helpful to roughly chop the chocolate bar up into smaller pieces for better melting capability. So next, I went ahead and used the microwave (feel free to use a double boiler!) to melt the chocolate. Do it in 20-30 second increments so it doesn’t burn and stir thoroughly each time you take it out. Once it’s melted, set it aside for a few moments. Next, in a large bowl, combine your room temperature/softened butter with your two types of sugars (brown and granulated). Similar to making chocolate chip cookies, you’re going to use your mixer and beat it until creamy – about 1 minute. Add in your 2 eggs (make sure they’re room temperature!) and your vanilla extract and mix again until super smooth. 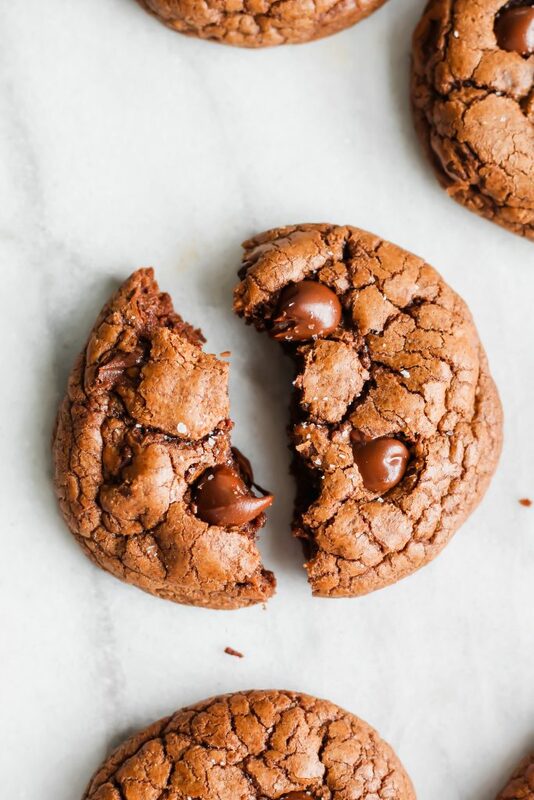 Once you have that delicious “chocolate chip cookie” batter, add in the melted chocolate! Mix it up with your blender until fully combined and smooth. To that delicious brownie cookie batter, using a sifter, add in your flour, baking powder, espresso powder and salt. Mix one more time (last time, I promise!) until combined and smooth. Gently fold in about ½ cup of chocolate chips. Let the batter chill in the fridge for about 45 minutes to 1 hour. Once chilled, it may be a little bit hard – so I used a tablespoon (instead of a cookie scoop!) to scoop out my dough. 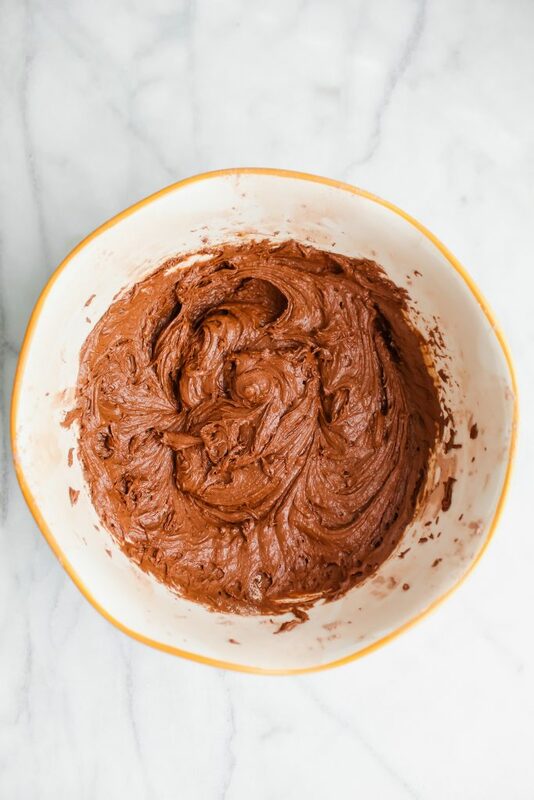 It was a hefty tablespoon worth – about 1.5-2 tablespoons but feel free to make your cookies bigger or smaller and adjust the size – you just might need to adjust the time baking! Roll your dough into balls and place on a lined cookie sheet. I baked mine for 11-12 minutes. The center will still not look all the way done but that’s okay because it’s 2019 and we aren’t here for overdone cookies okay?! 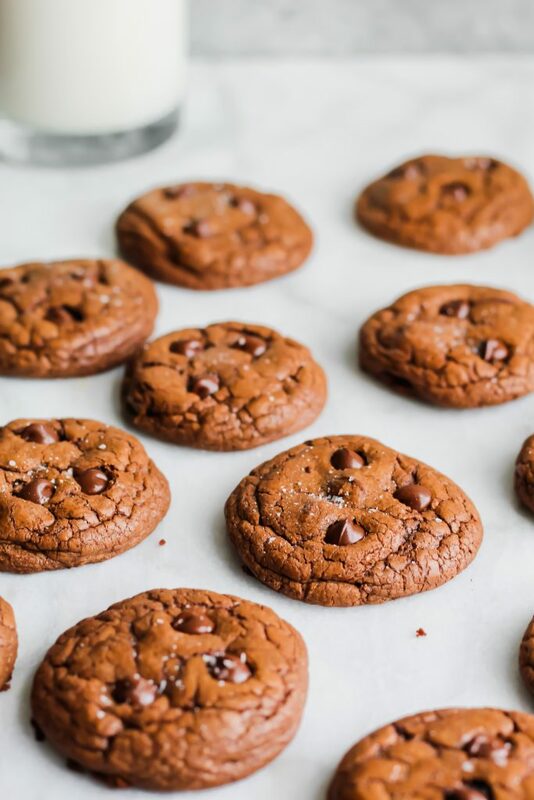 But really, if you let them cool on the pan for 5-10 minutes after you take them out of the oven – they will continue to cook a little bit more and firm up on the inside but still keep that delicious gooey center. While they’re still warm on the cookie sheet, I gently added a few more chocolate chips to each one. YUM. Oh, and I also added flaky sea salt because that’s just who I am as a person. Pour yourself a giant glass of milk and eat about 5 of these cookies because I promise, they’re worth it! Enjoy, my friends. Be sure to follow ourbalancedbowl on Instagram and tag me with your photo! You can also post a photo of your recipe to the Our Balanced Bowl Facebook page! I always love to see your re-creations! If you do make it, be sure to rate and comment so I can get your feedback! Xo! Add your 8 oz. of semi-sweet chocolate to a microwave safe bowl. Melt the chocolate in 20-30 second increments until it's smooth, stirring thoroughly each time you take it out to check. Set aside. In a large bowl, combine your softened butter with your brown and granulated white sugar. Beat with your mixer until creamy - about 1 minute. Add in your 2 room temperature eggs and your vanilla extract and beat until super smooth and creamy. To that mixture, add your melted chocolate. Mix until fully incorporated. Once your dough is fully incorporated, gently fold in your chocolate chips using a rubber spatula. I did about 1/4 cup chocolate chips into the dough and then topped them with 1/4 cup chocolate chips once they were baked and warm. Let your dough sit, uncovered, in the fridge for 45-60 minutes. About 15 minutes before you take your dough out of the fridge, preheat your oven to 350 degrees and line a couple of baking sheets with parchment paper of silicon. Once your dough is ready, it will be a little bit hard. I suggest using a tablespoon to scoop it out (about 1.5-2 tbsp worth of dough) into your hands and then rolling them into large balls. Place on the cookie sheet - I was able to fit 8 on one cookie sheet. Bake at 350 degrees for 11-12 minutes. The middles should still be slightly gooey. Once you've taken them out of the oven, let them cool on the pan for 10 minutes then move them onto a cooling rack. 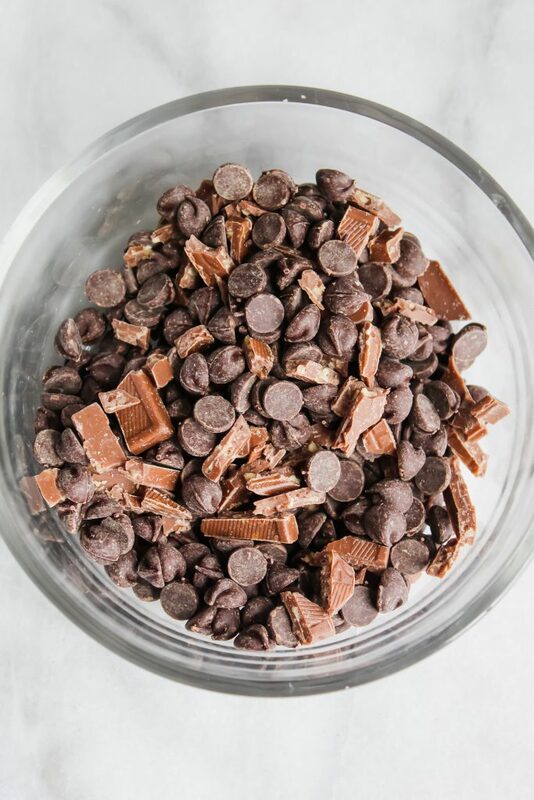 While still warm, place chocolate chips on the top of them, followed by a pinch of sea salt. Eat while warm! These can keep up to 3-4 days in a sealed container at room temperature. If you don't have room temperature eggs, place them in a bowl with lukewarm water for 15 minutes or so. This should do the trick! I’m gonna go eat the rest of these now. Mkay, bye. I just made these and they are delicious. Super easy as well. I didn’t let mine sit as long in the fridge and they still rolled perfectly. Great recipe!